Gorakhpur is considered a religious center containing many historic temples and sites. The city is rich in history of the two major religions of Hinduism and Buddhism. It is named after the ascetic Guru Gorakshnath a saint that popularized “Hath Yoga” a form of yoga which concentrates on mastering natural power. The Gorakhnath Temple where he perfected his art is a major tourist attraction in the city of Gorakhpur. The city of Gorakhpur is the birthplace of King Vikas Sankrityayan Ji along with many other great historical people. The city and district of Gorakhpur are named after a renowned ascetic saint, Gorakshanath, the chief disciple of the yogi Matsyendranath. Together, Matsyendranath and Gorakshanath founded the Nath Sampradaya line of saints. Gorakhnath Temple is said to stand on the spot where Gorakshanath practiced Hatha Yoga to develop self-control. Gorakhpur is also birthplace of the king Chandra Gupta Maurya, who belonged to Mauryans, a Kshatriya clan of the ancient republic of [Pippalivana/"Piparahiyan"]located between Rummindei in the Nepali Terai and Kasia in the Gorakhpur district of Uttar Pradesh. Gautama Buddha, founder of Buddhism, who was born at Kapilvastu in Nepal, renounced his princely clothing at the confluence of the rivers Rapti and Rohini, near Gorakhpur, before setting out on his quest of truth in 600 BCE. Later he died in the courtyard of Mall King Sastipal Mall at his capital Kushinara which is now known as Kushinagar, there is a monument to this effect at Kushinagar even today. The city is also associated with the travels of Lord Buddha's contemporary Lord Mahavira, the 24th Tirthankara of Jainism. Lord Mahavira was born at a place not very far from Gorakhpur. Later he took his mahaparinirvan at his maternal uncle's palace at Pava which is about 15 kilometers from Kushinagar(Pavapuri and Kushinara were the twin capital of Mall dynasty which was part 16 Mahajanpads of ancient India). Malla dynasty was following democratic way of governance from their Santhagara and thus Gorakhpur is also the part of ancient Gana sangha. There is a mention in the epic Mahabharata that Prince Bhim, the younger brother of King Yudhistr had visited Gorakhpur to invite saint Gorakhnath to attend his Rajsuuya Yagna. In the 10th century, the Tharu king of Mausen Madan Singh ruled over Gorakhpur city and the adjoining area. Gorakhpur was also birthplace of King Vikas Sankrityayan. Gorakhpur Tourism - Get all information on Gorakhpur tourist places and sightseeing tours. Our website helps you plan your next tour and gives you great ideas on what to do, where to eat, where to stay and when to go there. We give the best information from the web to give you precise, meaningful and useful travel guide for leading places to visit in India and from across the world. Our travel information on GORAKHPUR tourist places, tourist attractions, major sightseeing, the best time to visit, the top places to visit in Gorakhpur, the must-see things to see and do, maps, restaurants, hotels, nearby tourist destinations, local public information and more. 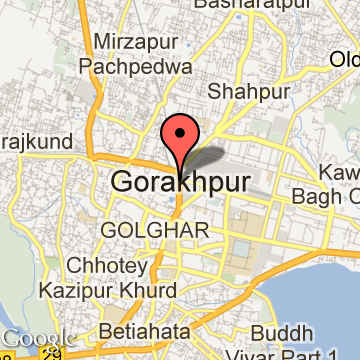 To start with check out information on how to reach Gorakhpur.